Nick Churton of Mayfair International Realty enjoys a very special New York house that borrows some distinctive English architectural details, shakes them up a bit – and it all comes out more than all right in the end. Houlihan Lawrence are the brokers. Every house everywhere has a best time of day. You will see how if you go and visit Arrowhead, Larchmont, New York in the afternoon when the sun is slightly lower in the sky and its light reflects off the 60-acre Sheldrake Lake that provides such a lovely backdrop to this house. It is the afternoon when natural light fills the rear facing rooms and especially the charming sitting room with its arched picture window and lovely aspect – perfect for reading. But it is not the rear of the house that solely attracts. The extraordinary front elevation does also. This is a fairytale English manor of a house. 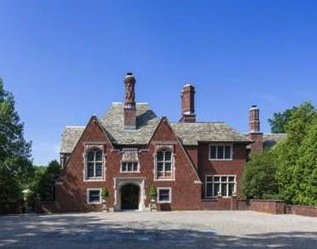 Under a randomly tiled, steeply pitched roof with feature tall chimneys which are perhaps more fairyland than England is a splendid Tudor style facade with stone mullion windows, polychromatic brickwork in a diamond geometric pattern and a heavy oak door with stately stone cartouche over. The interior follows the Tudor design theme and detail. Stone fireplaces; leaded and stained glass windows; tracery ceilings; oak panelling, doors and strip flooring all add to this exceptional inner space. Built in 1921 the house sits in 4.62 beautifully landscaped acres. A gatehouse which matches the main house in style guards the entrance to the property and there is a five-bay garage with an apartment above, flagstone terraces, swimming pool and extensive formal gardens and park. All these delights are just over 30 minutes from Grand Central station via Larchmont station just a few minutes away. This house works. Arrowhead hits the bullseye. I think you will like it – whatever time of the day or night you see it, but especially in the afternoon.